The Society’s new season of talks begins on Thursday 11th September at 7:30 pm in St. Andrew’s Church, Bilston Street, Sedgley. The speaker is Mrs Andree Hickey who worked for the Ettingshall based firm from the 1950s until the closure in the late 1970s. Memorabilia, photographs and a digital presentation promise a fascinating insight into a world of work fondly remembered. This place of worship has nearly reached its 160th birthday. 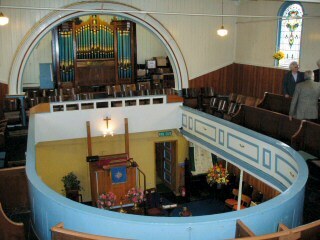 This view of the interior of Upper Ettingshall Methodist Church was taken in October 2004. Built on Upper Ettingshall Road in 1850 to hold 300[! ], it was once known as Sodom Primitive Methodist. The organ dates from 1924.